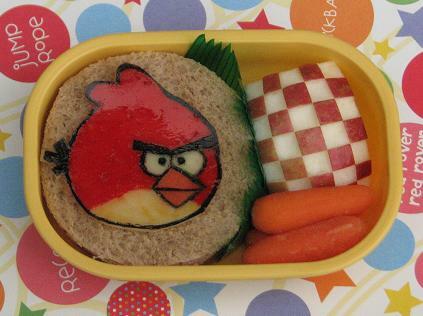 Kidlet has a soy ham sandwich with gouda Angry Bird, carrots, and checkered apple. Jenn this is awesome!!! My daughter said that it is amazing! :) Angry Birds FTW! That's awesome! A-chan plays Angry birds. She loves it too :D Sounds like the gouda was causing a rough morning. I think I've had trouble with gouda, too. Too soft and squishy and it mucked up the cutters I was trying to use on it! Bad gouda, bad.